Mutations in genes involved in the muscular glycogen metabolism cause glycogen storage myopathies and cardiomyopathies.1,2 Defects in enzymes that control muscle glycogen breakdown are more common than diseases involved in glycogen synthesis. Glycogenin is a glycosyltransferase that catalyzes the formation of an 8–12 glucose molecule chain at its tyrosine 195 residue.3 Two types of glycogenin have been identified in humans: glyocogenin-1 and glycogenin-2 encoded by GYG1 and GYG2 genes, respectively.4,5 Glycogenin-1 (37 kDa) is expressed preferentially in skeletal muscle and to a lesser extent in the liver, whereas glycogenin-2 (66 kDa) is abundant in cardiac muscle and the liver but sparse in the pancreas and absent in skeletal muscle. We report here a detailed clinical and muscle imaging assessment as well as protein and genetic features of 9 patients with GSDXV. 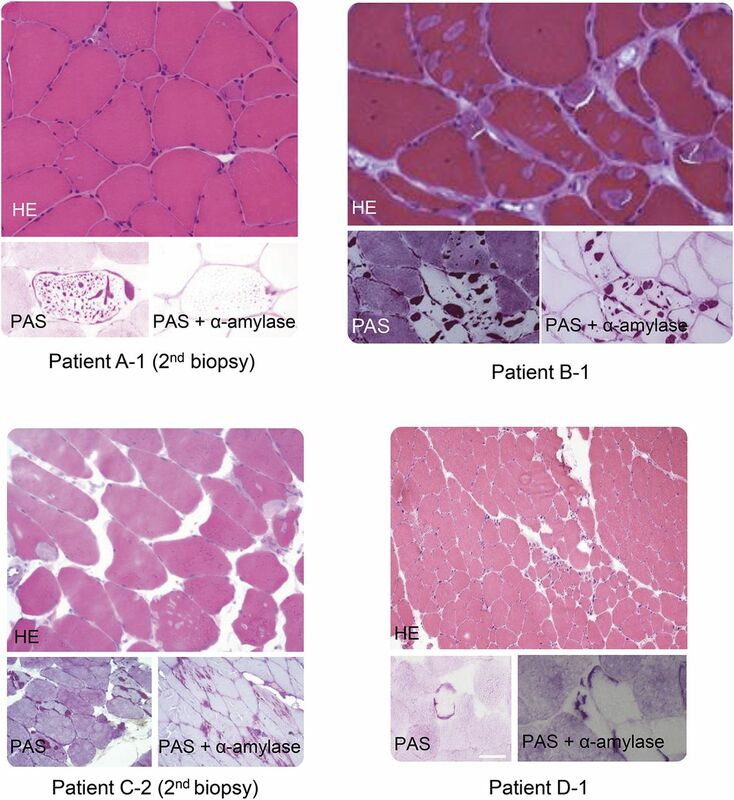 Remarkably, the clinical spectrum uncovers not only the previously reported proximal myopathy but also new muscle patterns, thus extending the clinical conditions due to GYG1 gene mutations. Five men and 4 women from 5 families originating from France (families A, B, and C) and Denmark (families D and E) were included in this study (table and figure 1). Clinical, histologic, and muscle imaging data were taken from the patients' medical records. Patient B-1 was reported as patient P1 in a previous publication.7 During their follow-up, muscle imaging was performed in all patients, except patient C-3: muscle CT in 4 patients, muscle MRI in 2, and whole-body MRI in 6 (figure e-1, links.lww.com/NXG/A13). Written informed consent was obtained from all patients before muscle biopsies and DNA collection. At least 1 muscle biopsy was performed in 6 patients (3 in A-1, 2 in C-2, and 1 in B-1, C-1, D-1, and E-1) in deltoid in 4 patients, extensor carpi radialis in 2, tibialis anterior in 2, and vastus lateralis in 2. Morphologic and histochemical analyses of fresh-frozen muscle tissue were performed by standard techniques, including periodic acid–Schiff (PAS) staining before and after digestion with α-amylase15 (figure 2). After DNA extraction from peripheral leukocytes, coding regions of GYG1 were sequenced (DNA Blood Mini kit, Qiagen, Hilden, Germany) and compared with the reference sequence (accession number NM_004130). Total messenger RNAs (mRNAs) were extracted from a fresh muscle biopsy of patient B-1 (RNA Mini kit, Qiagen, Hilden, Germany) and amplified by reverse transcription PCR (Promega, Fitchburg, WI). Exome sequencing was performed in family C at the French National Centre for Genotyping and in family D at the Broad Institute's Genomics Platform. Pathogenic mutations were confirmed by Sanger sequencing. Expression of glycogenin-1 in myoblast cell culture from patient A-1 and frozen muscle tissue from patients B-1, C-1, and C-2 were explored by Western blot with monoclonal antibodies against human glycogenin-1 N-terminal 1:500 (Abnova, Taipei, Taiwan) with or without α-amylase treatment as previously described.7 For this purpose, samples were treated with 10 µg/mL human α-amylase (Sigma-Aldrich, St. Louis, MO) for 1 hour at 37°C to remove sugar residues of the large glycogen molecules. Protein extracts were separated onto 10% Mini-PROTEAN TGX precast gels (Bio-Rad Laboratories, Marnes-la-Coquette, France). Immunoblots were visualized by Immobilon Western Chemiluminescent HRP Substrate (Millipore, Guyancourt, France) on a G-Box system using GeneSnap software (Ozyme, Montigny-le-Bretonneux, France). The glucosylated form of glycogenin-1 differs in size by approximately 1 kDa compared with the α-amylase–treated control. Clinical and muscle imaging features. Clinically, the 9 patients in this study can be categorized into 3 subgroups according to the pattern of muscle affection: proximal, distal, and scapuloperoneal. The proximal subgroup included patients B-1, B-2, and E-1 who showed a teenage onset of pelvifemoral (B-1, B-2, and E-1) and scapular weaknesses (B-1 and B-2) (table and figure 1). This muscle affection was confirmed by muscle imaging, showing partial and symmetric fatty replacement of deltoid muscles in upper limbs and a more advanced involvement of gluteus magnus and medius, vastus lateralis and intermedius, adductor magnus, and biceps femoris muscles in lower limbs (figures e-1E, e-1E′, e-1F, e-1F′, e-1G, e-1G′, e-1O, and e-1O′, links.lww.com/NXG/A13). Conversely, patients C-1, C-2, and C-3 had a predominant distal myopathy pattern, manifesting late in the fifth–eighth decade of life by asymmetric stepping gait (table). Unfortunately, muscle imaging was performed only in patient C-1 at disease onset and showed a highly specific extensor tibialis anterior muscle involvement (figure e-1I, links.lww.com/NXG/A13). No earlier muscle imaging was available for patients C-1 and C-2, and the oldest sister C-3 refused medical investigations. At more advanced stages, the disease affected extensor digitorum and medial gastrocnemius muscles (figures e-1I, e-1J, e-1K′, e-1L, and e-1M′) but also progressed toward proximal muscles (figures e-1J, e-1J′, e-1K, e-1K′, e-1L, e-1M, and e-1M′). Another unexpected presentation was observed in patient A-1, who had a scapuloperoneal distribution in the first stages of the disease. For this patient, muscle imaging was performed 4 times over the course of 20 years, allowing us to precisely track muscle involvement distribution and progression. In the first 7–8 years of the disease onset, the pattern was clearly peroneal in lower limbs, involving tibialis anterior and extensor digitorum longus muscles and to a lesser extent the soleus muscles (figure e-1A, links.lww.com/NXG/A13) and scapular muscles in upper limbs, mainly deltoid muscles in an asymmetric pattern (figure e-1B). After 13–14 years of progression, the disease involved almost all calf muscles and spread to the thighs and pelvic muscles, while at this time, deltoids had become totally replaced by fat (figure e-1C and e-1C′). In more advanced stages, 23–24 years after disease onset, almost all lower limb muscles, anterior arm, and posterior forearm compartments were involved (figure e-1D and e-1D′). Patient D-1 is peculiar, as she was diagnosed with the disease at 50 years of age with difficulties climbing stairs, suggesting a proximal lower limb weakness at onset. Her assessment 26 years later showed facial muscle weakness with a highly asymmetric scapulohumeral and pelvifemoral myopathies, thus resembling facioscapulohumeral dystrophy (FSHD), which was excluded by genetic testing. Muscle imaging showed a peculiar pattern with scapulohumeral and a more diffuse lower limb involvement. Unfortunately, there was no muscle imaging performed at disease onset to better categorize this patient pattern of myopathy. However, the fact that distal parts of the upper and lower limbs were more conserved than proximal parts suggests that patient D-1 should be categorized within the proximal subgroup of patients. Of note, asymmetric limb involvement was found in 4 patients (A-1, C-1, C-2, and D-1) involving deltoid muscles in 2 (A-1 and D-1) and distal lower limb muscles in 2 (C-1 and C-2). In addition, the creatine phosphokinase (CPK) level was either normal in the oldest patients (C-1, C-2, C-3, D-1, and E-1), while as high as 7 times above the upper reference level in the youngest (A-1, B-1, and B-2). All 9 patients reported here were also regularly assessed for heart and respiratory involvement. Only 2 patients (patients C-1 and C-2) had cardiac abnormalities in the context of coronary artery disease at age 58 and 76 years, respectively. Except for patient A-1, who had mild restrictive respiratory syndrome, and patient C-1 requiring night time nasal ventilation for obstructive sleep apnea syndrome since age 70 years, respiratory assessments were unremarkable in all other patients. Almost all the 6 patients who had a muscle biopsy performed showed PAS-positive inclusions, partially resistant to α-amylase, representing polyglucosan bodies (figure 2). Abnormally structured glycogen, suggesting polyglucosan bodies, was shown on electron microscopy in patients A-1, B-1, C-2, D-1, and E-1 (data not shown). Abnormal histologic findings, usually not associated with GSDXV, were found in a few patients, such as mild necrosis (patient C-1), moderate endomysial fibrosis (patients C-1 and C-2), abnormal mitochondria accumulation (patients C-1), and extensive fatty replacement and myofibrillar disarrangements (patient C-3). Exome sequencing of families C and D led to the identification of 3 novel mutations in GYG1. In family C, we identified 2 compound heterozygous mutations: a small 10 bp out-of-frame deletion in the last coding exon (NM_004130.3, c.996_1005del10, p.Tyr332*) leading to a frameshift that creates a premature stop codon and may produce a truncated protein and the previously reported splicing mutation in intron 2 (c.143+3G>C).7 The intron 2 mutation was found in a heterozygous state in a nonaffected brother and sister, while the 10-bp deletion was found in a heterozygous state in another nonaffected brother. In patient D-1, 2 compound heterozygous mutations (c.166G>C, p.Asp56His/c.472delA, p.Asp159Thrfs*5) were identified. Expression of glycogenin-1 is shown in figure 3. Under normal conditions, glucosylated glycogenin-1 within glycogen particles cannot be detected unless the epitope is exposed after digestion with α-amylase. In patient A-1 (figure 3B), glycogenin-1 was absent before and after α-amylase treatment, indicating that glycogenin-1 is not produced. In patient B-1 (figure 3B), glycogenin-1 was not detected before α-amylase treatment, while it was reduced after α-amylase treatment compared with control, indicating that the expressed glycogenin-1 protein is still able to autoglucosylate. In patients C-1 and C-2 (figure 3, C and D), glycogenin-1 was detected before α-amylase treatment (2 bands with a slight molecular weight difference) and was still present (but lower molecular weight) at similar amounts after α-amylase treatment, indicating preserved protein expression but impaired glucosylation. We report 9 patients who showed unexpected clinical phenotypes and variable protein consequences because of mutations in the GYG1 gene of which 4 are novel. Patient A-1 had an initial scapular and peroneal pattern of muscle affection, which has not been described previously in patients with GSDXV. However, 1 patient described in the original description of the disease6 likely could have had the same phenotype since he was described to have weakness of shoulder abduction, elbow flexion and extension, and foot dorsiflexion. Unfortunately, no muscle imaging was performed in that patient to more accurately classify the pattern of affection. In family C, the disease started distally and evolved to the proximal limb compartments. By contrast, the 9 published patients showing distal involvement6,–,10 had either an initial diffuse7,8 or a proximal6,7,9,10 pattern. Only 1 published case7 may be reminiscent of family C with primary distal involvement, although the disease started late in lower limbs. On the other hand, our 4 patients with proximal pattern are similar to almost all the 20 cases reported so far.7,–,12 Indeed, these previously reported patients had a wide range of age and symptoms at onset that generally pointed toward limb-girdle weakness.7,–,12 In some instances, symptoms of onset suggested exercise intolerance,8,9,11,12 which was modest and was not the predominant feature of the phenotype. CPK levels were usually normal but were found mildly to moderately elevated in 3 cases, reaching almost 1,100 IU/L in the youngest patient.7,9,11 The disease course was progressive in all patients, and muscle weakness was most disabling in the 7 oldest patients (aged 57–82 years), as they were unable to raise arms above their head and required aid for walking short distances or permanent wheelchair use. Muscle imaging was described only in 5 patients.8,10,–,12 Except for 1 patient with almost all muscles involved,10 the 4 others had mainly affected scapular and pelvifemoral girdle muscles similar to our patients B-1, B-2, and E-1 (figure e-1, links.lww.com/NXG/A13). The open ring-like aspect of the right soleus muscle observed in 1 patient8 was never observed in our patients. As for previously published patients,7,8,10,11 an intriguing asymmetry was observed in at least 5 of our patients manifesting as asymmetric weaker upper limb elevation or scapular winging, associated in 1 patient with facial weakness leading initially to a clinical diagnosis of FSHD. Thus, the presence of an asymmetric muscle involvement in a patient with glycogen storage myopathy should prompt GYG1 gene analysis. Cardiac involvement has to be evaluated with care. A patient previously reported6 developed ventricular fibrillation since age 19 years, which required implantable cardiac defibrillator. Among the 18 other published cases, 11 had normal cardiac assessments, while 7 had variable and inconclusive cardiac abnormalities usually at advanced ages and sometimes with clear coronary arteries or high blood pressure diseases.7,–,12 These findings are similar to those of our patients. Recently, a series of 3 patients with GYG1 mutation with severe cardiac affections but with no skeletal muscular involvement was published,14 suggesting that distinct phenotypes with cardiac or skeletal muscle involvement exist, which could relate to the mutation type. All of our biopsied patients exhibited inclusions containing PAS-positive material partially resistant to α-amylase and abnormally structured glycogen suggesting polyglucosan bodies. This is similar to 17 of the 20 previously reported patients, in whom a major finding was the presence of inclusions in the center and subsarcolemmal regions of up to 50% of the fibers, containing a partially α-amylase–resistant PAS-positive material. Inclusions surrounded by normal glycogen content were visualized in some fibers. In other fibers, a depletion of normal glycogen was observed around the inclusions. Similar to previously reported cases,7,12 some of our patients showed occasionally atypical features such as nemaline rods and increased interstitial connective and fat tissues. It is worthy to note that among those patients who had abnormal PAS-positive inclusions, 2 had a first muscle biopsy which was either normal10 or showed nonspecific myopathic features.9 Moreover, there are 2 patients who showed nonspecific myopathic changes without inclusions or polyglucosan bodies.9,11 These atypical features emphasize the benefit of repeating muscle biopsy when the diagnosis has not formerly been established. The fact that mutations in 1 gene may lead to such various clinical patterns is one of the intriguing results that arise from our study. From this point of view, the mutation c.143+3G>C seems to be particularly demonstrative. Clinically, all the previously reported 11 patients carrying the homozygous c.143+3G>C mutation had a proximal pattern similar to the one observed in the 2 affected patients from our family B. However, there is a great heterogeneity at least in terms of age at disease onset among individuals carrying this homozygous mutation. In fact, the 2 patients from family B had a teenage onset, while their younger brother is still asymptomatic, suggesting incomplete penetrance of this mutation. By contrast, the age at onset of the disease in the 11 published patients carrying this homozygous mutation ranged from childhood to 55 years old. A muscle complementary DNA study from our patient B-1 revealed not only the mRNA with exon 2 skipped as previously described7 but also the normal one. This new finding can explain faint traces of protein observed in patient B-1 myoblasts on Western blot and in the different muscle biopsies of patients of family C, suggesting variable levels of mRNA splicing in these tissues. We speculate that the level of normal transcript expression may modulate the deleterious effect of glycogenin-1 deficiency and therefore the age at onset and symptom intensity. Moreover, this balance between the 2 forms seems variable among individuals. In our series, the c.143+3G>C mutation was also found in a compound heterozygous state combined with the new nonsense c.646C>T mutation (p.Arg216*) or the new out-of-frame 10 bp deletion c.996_1005del10 (p.Tyr332*). The c.646C>T mutation may result in a complete absence of protein production through an mRNA nonsense-mediated decay phenomenon. 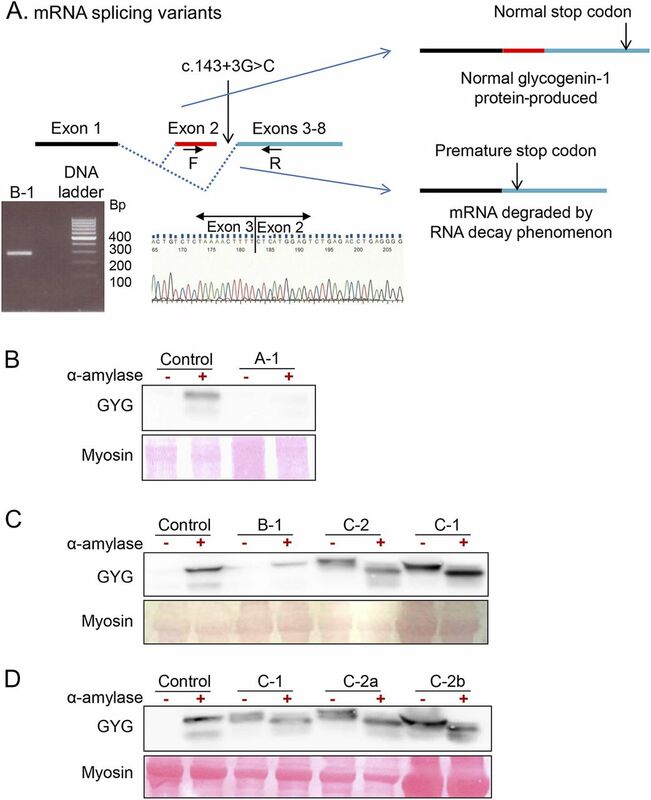 The total absence of glycogenin-1 on Western blot found in myoblasts from patient A-1 reinforces the notion of such a mechanism. On the other hand, a Western blot study of muscle biopsies from patients C-1 and C-2 revealed the presence of 2 unglucosylated glycogenin-1 bands without α-amylase treatment, probably the normal form and the shorter form related to p.Tyr332*. This result is comparable with a Western blot finding from previously reported patient 77 carrying the c.143+3G>C mutation and the nonsense c.970C>T (p.Arg324*), which also showed 2 unglucosylated glycogenin-1 bands without α-amylase treatment. Based on this observation, we speculate that this shorter protein had different deleterious effects on the normal one resulting from the c.143+3G>C mutation. We hypothesize that truncated GYG1 protein impairs normal autoglucosylation of the normal form. Different phenotypes could be explained by imbalance in the production of normal mRNA, mRNA with exon 2 skipped, and truncated mRNA. The more this shorter protein is abundant, the more distal the phenotype seems to be. Clearly, these mutations need to be more deeply investigated at mRNA, protein, and functional levels to help us better understand their phenotypic consequences. Our findings demonstrate that GYG1 mutations may lead to a wide spectrum of clinical phenotypes including limb-girdle and scapuloperoneal muscle weaknesses but also late-onset distal myopathy. This study also highlighted the value of glycogenin-1 protein and mRNA studies to better understand the phenotype/genotype correlations in this group of diseases. R. Ben Yaou, A. Hubert, and D. Gaist: study concept and design and drafting/revising the manuscript. R. Ben Yaou, I. Nelson, P. Petiot, J.R. Dahlqvist, M. Krahn, F. Michel, R.Y. Carlier, T. Krag, and J. Vissing: acquisition of data. A. Hubert, I. Nelson, N. Streichenberger, M. Beuvin, F. Parisot, E. Malfatti, N. Romero, M. Duno, M. Cerino, M. Bartoli, G. Bonne, and F.M. Petit: analysis and interpretation. B. Eymard and P. Labrune: critical revision of the manuscript for important intellectual content. G. Bonne, J. Vissing, P. Laforet, and F.M. Petit: study supervision. R. Ben Yaou, A. Hubert, I. Nelson, and J. Dahlqvist report no disclosures. D. Gaist has received honoraria from AstraZeneca and has received research support from the Danish Cancer Society. N. Streichenberger and M. Beuvin report no disclosures. M. Krahn has served on the editorial board of Cahiers de Myologie; holds patents for “Exon-skipping for dysferlinopathies therapy” and “In vitro genetic diagnostic of inherited neuromuscular disorders”; and has received research support from the European Community Seventh Framework Program, INSERM, and AFM-TELETHON. P. Petiot, F. Parisot, and F. Michel report no disclosures. E. Malfatti has served on the editorial board of Frontiers in Neurology. N. Romero reports no disclosures. R. Carlier has received speaker honoraria from Genzyme. B. Eymard has been a consultant for conferences of LFB, Biogen and BioMarin companies and has received research support from Association Française contre les myopathies (AFM). P. Labrune and M. Duno report no disclosures. T. Krag has received research support from AP Møller Foundations, the Augustinus Foundation, and the Danielsen Foundation. M. Cerino and M. Bartoli report no disclosures. G. Bonne has served on the editorial boards of the Journal of Neuromuscular Diseases and Neuromuscular Disorders and has received research support from the ANR French-German grant (ANR-BMBF), Association Institut de Myologie (AIM), GIS Maladies Rares “Plateforme Mutations,” and the CURE-CMD Translational Award. J. Vissing has served on the scientific advisory boards of Sanofi/Genzyme, aTyr Pharma, Ultragenyx Pharmaceuticals, Santhera Pharmaceuticals, Sarepta Therapeutics, Novo Nordisk, Alexion Pharmaceuticals, and Stealth BioTherapeutics; has received travel funding and speaker honoraria from Sanofi/Genzyme, Alexion Pharmaceuticals, Ultragenyx Pharmaceuticals, Santhera Pharmaceuticals, and aTyr Pharma; has served on the editorial boards of Neuromuscular Disorders and the Journal of Neuromuscular Diseases; and has received research support from the Lundbeck Foundation, the Novo foundation, the Danish Medical Research Council, the University of Copenhagen, and the Research Committee of the National Hospital. P. Laforet is a member of the Sanofi Genzyme Pompe advisory board; has received travel funding and speaker honoraria from Sanofi Genzyme; and has received research support from Sanofi Genzyme, Valerion Therapeutics, and the French Glycogenosis Association. F. Petit reports no disclosures. Go to Neurology.org/ng for full disclosure forms. The authors thank Nicolas Levy for his contribution to molecular investigations.
. Glycogen and its metabolism. Curr Mol Med 2002;2:101–120.
. New insights in the field of muscle glycogenoses. Curr Opin Neurol 2013;26:544–553.
. Glycogenin: the primer for mammalian and yeast glycogen synthesis. Biochim Biophys Acta 2004;1673:45–55.
. The human skeletal muscle glycogenin gene: cDNA, tissue expression and chromosomal localization. Biochem Biophys Res Commun 1996;220:72–77.
. Glycogenin-2, a novel self-glucosylating protein involved in liver glycogen biosynthesis. J Biol Chem 1997;272:27589–27597.
. Glycogenin-1 deficiency and inactivated priming of glycogen synthesis. N Engl J Med 2010;362:1203–1210.
. A new muscle glycogen storage disease associated with glycogenin-1 deficiency. Ann Neurol 2014;76:891–898.
. Muscle pathology and whole-body MRI in a polyglucosan myopathy associated with a novel glycogenin-1 mutation. Neuromuscul Disord 2015;25:780–785.
. GYG1 gene mutations in a family with polyglucosan body myopathy. Neurol Genet 2015;1:e21. doi: 10.1212/NXG.0000000000000021.
. Longitudinal follow-up and muscle MRI pattern of two siblings with polyglucosan body myopathy due to glycogenin-1 mutation. J Neurol Neurosurg Psychiatry 2016;87:797–800.
. Late-onset polyglucosan body myopathy in five patients with a homozygous mutation in GYG1. Neuromuscul Disord 2016;26:16–20.
. Start codon mutation of GYG1 causing late-onset polyglucosan body myopathy with nemaline rods. J Neurol 2016;263:2133–2135.
. Molecular pathogenesis of a new glycogenosis caused by a glycogenin-1 mutation. Biochim Biophys Acta 2012;1822:493–499.
. Cardiomyopathy as presenting sign of glycogenin-1 deficiency-report of three cases and review of the literature. J Inherit Metab Dis 2017;40:139–149.
. Muscle Biopsy: A Practical Approach. 2nd ed. London: Bailliere Tindall; 1985.